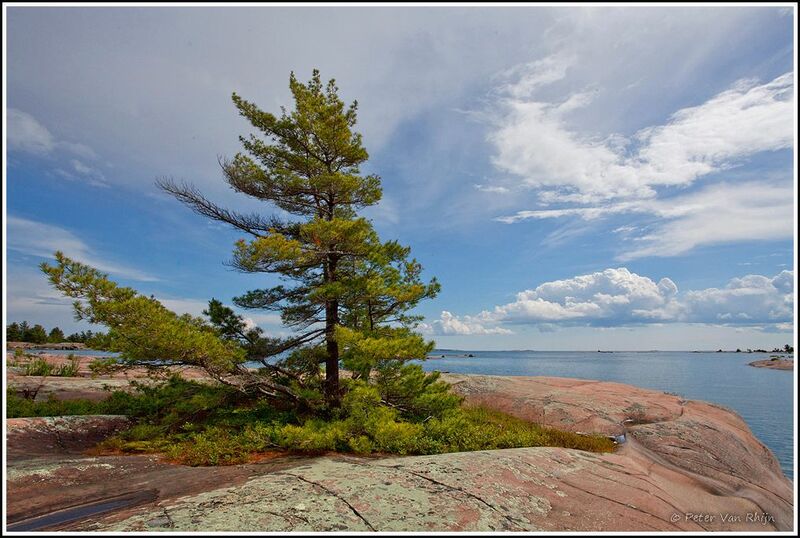 The wind-blown white pine is iconic for the Canadian landscape. It is the Provincial Tree of Ontario. Wind-blown white pines are depicted in many Group of Seven paintings and in images by landscape photographers like Bud Watson. The white pine is potentially the tallest tree in eastern North America. Its logs have been used for numerous purposes including masts for the British Royal Navy. In recent years a lot of white pines along the Georgian Bay coast have been toppled by storms. After the last ice age, much of the topsoil along the coast had disappeared, scraped off the hard granite by the glaciers. Once the tree grows too tall, it ends up getting blown over. Before they are blown over these trees often take on a very characteristic windblown appearance which can be very appealing visually. In this image, lines seem to emanate from the left lower strong point into all directions. An unusual but welcome form of visual order. The wide angle view reinforces this composition. Canon 5D Mark ll, 1/400th sec, F20, 17-40 Zoom at 17 mm. Tripod. ISO 200.